Executive Mosaic’s GovCon Index closed at a new all-time high for a fourth consecutive session on strong fourth quarter earnings from Huntington Ingalls Industries (NYSE: HII) as the U.S. benchmark S&P 500 retreated Thursday after a five-day stretch of record closes. Both the GCI and U.S. equities had set continued record highs during those streaks on investor optimism over President Donald Trump’s economic agenda focused on deregulation, tax cuts and domestic stimulus with increases to defense spending. 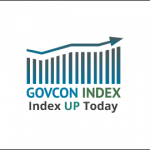 GovCon Index advancers outnumbered decliners by a 2-to-1 ratio as eight out of 11 S&P 500 components moved green with Huntington Ingalls the GCI’s top overall net performer at a $5.00 gain and Northrop Grumman (NYSE: NOC) the leading gainer among co-listed stocks. Huntington Ingalls opened to a new 52-week high after the military shipbuilder posted fourth quarter earnings of $3.62 per share versus Wall Street’s forecast of $2.45 on $1.92 billion in revenue, which narrowly exceeded analysts’ expectations of $1.86 billion. Four other GovCon Index stocks hit 52-week highs during intraday trade: Boeing (NYSE: BA), General Dynamics (NYSE: GD), Harris Corp. (NYSE: HRS) and CAE (NYSE: CAE). Nine/Ten GCI stocks rose by at least $1.00 each: Huntington Ingalls, Northrop, Boeing, Harris, Lockheed Martin (NYSE: LMT), CACI International (NYSE: CACI), Engility Holdings (NYSE: EGL), ICF (Nasdaq: ICFI), ManTech International (Nasdaq: MANT) and Science Applications International Corp. (NYSE: SAIC). Energy shares tumbled 1 percent to lead seven major S&P sectors lower with utilities the top advancer among the remaining four, while the financial sector that has paced much of Wall Street’s recent gains ended a six-day win streak. Crude oil futures in New York settled down 26 cents to $52.85 a barrel on trader concern that rising U.S. inventories could add to a global glut even as OPEC and other major producers work to scale back supply, Reuters reported.